The Seven Sisters series has been a favorite of mine for the last few years! I have read all of them except the third book, not sure how I missed that one, which ironically was the one I was looking forward to most, but I will definitely be going back to read it as soon as I can. Riley writes with such an elegance and I love how each “Sister” novel stands alone but all together they form singular parts to a larger story. This series also explores a lot of different cultures and setting around the globe, it’s like getting to travel to exotic locations without having to leave your house. Each book is truly a treat to read so when this one came up for review, it was an unequivocal yes! In 1912, in the poor gypsy community outside the city walls of Granada, Lucía Amaya-Albaycin is born. Destined to be the greatest flamenco dancer of her generation—and named La Candela, due to the inner flame that burns through her when she dances— Lucía is whisked away by her ambitious and talented guitarist father at the tender age of ten to dance in the flamenco bars of Barcelona. Her mother is devastated by the loss of her daughter and as civil war threatens in Spain, tragedy strikes the rest of her family. Now in Madrid, Lucía and her troupe of dancers are forced to flee for their lives, their journey taking them far across the water to South America and eventually, to North America and New York—Lucía’s long-held dream. But to pursue it, she must choose between her passion for her career and the man she adores. 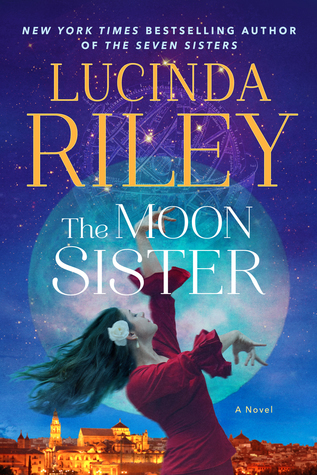 The Moon Sister follows these two women on their journey to discover their true futures—but at the risk of potentially losing the men they had hoped to build futures with (summary from Goodreads). Every time I read a ‘Sister’ book, it is so easy to get enveloped in the story and lost for what you think is minutes, which turns out to be hours. I love exploring all the exotic locations and traveling the world with each very different type of woman. In this book, Tiggy, is the spiritual sister. I found that I identified with her less than the others but yet somehow I managed to liked her the best out of the sisters. I thought that placing Tiggy in the Scottish Highlands fit so perfectly with her spiritual nature and offered an elegant yet mystical backdrop to the novel. The transition from modern day story to historical story was flawless and effortless. Riley is a gifted writer and makes each story unique and exciting while neither manages to eclipse the other. I have read other authors who have attempted this, but no one does it as well as Riley. One of the things I loved most about this novel was the flamenco dancing descriptions. The author really brought to life the flamenco culture and beauty to life in this book. I love how Spanish culture was sprinkled throughout a book with one character being in the Scottish Highlands. It totally worked for me and I loved how they mixed together to create a memorable story and setting. I absolutely adore this series and I can’t wait to meet the next sister in this series! While I have electronic copies of these books, I have also bought hard copies because the covers are to die for! These are books that you want on your shelf! Free review copy provided by publisher, Atria Books, in exchange for an honest review. All opinions are my own and in no way influenced.